1. Mention friends in a check-in without checking them in – Foursquare quietly removed this feature last year, leaving only the ability to mark a friend as “checked-in” with you. This meant that you could no longer mention a friend in a check-in who was not actually with you and instead had to tag them in the comments area. This reduced the community “feel” of Foursquare. People could no longer connect with each other by simply mentioning each other in a check-in text. Swarm has brought this feature back. Simply mention a friend in the check-in and then tap on their picture in the bottom to toggle whether they are being marked as a checked in with you or just being mentioned in the check-in. 2. The return of the feed – Another major feature that Foursquare removed last year was the feed. This was a feature that was introduced many versions ago and enabled you to see a scrolling feed of your friend’s check-ins as they were made instead of just where your friends were last. This brought the Foursquare community even closer. With the feed, friends can watch each other’s days progress and see checkins that would otherwise have gone unnoticed. 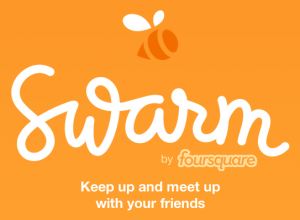 Foursquare has brought this feature back with Swarm. 3. Plans – There used to be an app called Forecast that integrated with Foursquare and let you share what your plans were with your friends. Friends could mark that they were interested in joining you for those plans and it was all integrated with Foursquare venues and check-ins. I used it regularly and found it to be very useful. Unfortunately that app shut down and nothing ever rose to the occasion to take it’s place- until now. Swarm delivers what I feel is the spiritual successor to Forecast: a feature called Plans With plans you are able to post a note saying that you plan to do something (presumably tied to your current location) and your friends can say that they’d like to join you. You’re able to tag venues to your plan (type the @ symbol and then type the name of the venue- only venues nearby will show up in the search results though) and tag friends as well (essentially inviting them to join you). I can’t wait to try this out with friends and see how this feature evolves. 4. Location-based sort of friend’s list – Over the years, Foursquare has struggled with the best way to display what your friends are doing near you while also displaying what you friends around the world are doing. With Swarm, Foursquare has finally nailed it. Swarm’s home screen shows your friends who have recently checked in and sorts them by how close they are based on their last location share- making it very easy to see where all of your friends are no matter where they are in the world. It also displays stickers and Emoji (more on that later) as well as whether there are comments or likes a friend’s most recent checkin. This is a welcome addition and when combined with the feed I feel that this enables you to stay more closely in touch with more people than before. Plus there is a hidden search feature on the home screen that you can access by scrolling the list down. You can now search for a specific friend in case you have a very long friend list or to see a friend’s last location in case they haven’t checked-in in a while. 5. Stickers – Gone are badges. May they rest in peace. All of your old badges are still accessible but Foursquare is no longer awarding new ones. Instead Swarm has introduced stickers. These are decorations that you can add to your profile icon when you check in. The sticker is then displayed on your avatar on the homepage as well as in the feed. Foursquare has said that you will be able to unlock stickers, similar to unlocking badges, based on certain situations. I feel that this is a great addition to the check-in experience and brings some fun back to checking in. 6. 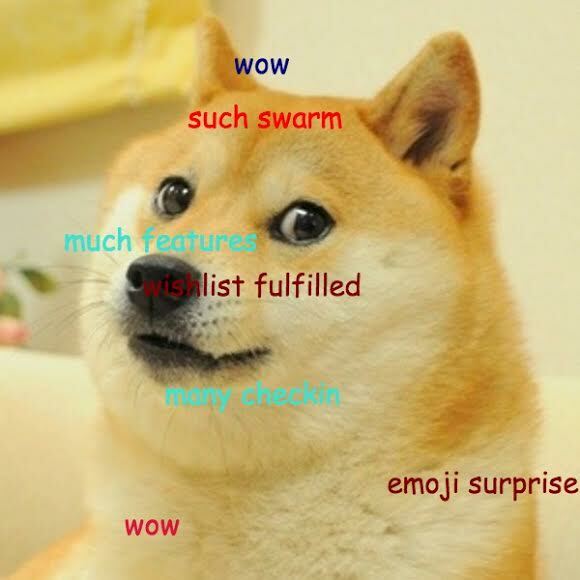 Emoji – Foursquare has fully embraced Emoji with Swarm. Now with Swarm if you add emoji to a checkin text the Emoji will display on your avatar like a sticker. Note that if you have a sticker selected with your check-in that the sticker will override the emoji. This feature brings another layer of fun to checking in and I feel that it will make emoji even more popular. 7. Complete data transfer PLUS check-in search – Even though this is a new app, Foursquare has brought forward all of your old data. In addition, they have added the ability to search your check-in data for the first time. Just tap your profile icon and then use the search box at the top of your check-in history to find out if you’ve been somewhere before and when you were there. 8. Other awesome – Foursquare is also keeping features like sharing insights after a check-in, the ability to comment and “like” a check-in, the ability to share check-ins on Twitter and Facebook and other core basic features. Other major features they’ve introduced include Neighborhood Sharing (the option to automatically share which town you are currently in) as well as the ability for mayorships to be awarded based on you checking in at a place more often then your friends (versus only one mayor that is awarded to the person who checks in the most overall, friends or no). Personally I’d prefer to see BOTH an overall mayor AND a “best of your friends” mayor. I am excited that mayorships are still around in some form and I’m happy to know I can still compete with my friends to see who has checked in somewhere the most. Neighborhood Sharing I’m taking a wait and see approach. I think it has a lot of potential because it will enable friends to passively share their location, keeping people more closely in touch automatically. In addition, by choosing to only identify which town or city you are in, Foursquare seems to have finally solved the challenge that automatic checkins have always posed, which was determining what the right location was to automatically check the user into. Wrapping things up, yes- there are no more points (SADFACE). There are no more check-in specials (this one I’m really hoping to see come back somehow). There are also many unanswered questions (such as will there be a way for brands to translate their presence into Swarm and have “followers” like they could with Foursquare?). But overall I’m thrilled with Swarm and I’m very excited that so many of the community-oriented features that had been removed from Foursquare are now back and better than ever in Swarm. I can’t wait to see how awesome it becomes once everyone moves over from the Foursquare app and begins checking in. See you there! Since then, we’ve had over 1,000 clicks on our bit.ly links and have received a ton of retweets, tweets, facebook posts, likes and comments posted from people wanting to share the news about the panel (including a tweet from a certain someone that uh, had a large effect on our stats as shown in the pic – thanks @dens and @foursquare!). And that’s only the measurable stuff – we don’t even know how many votes we got. I am overwhelmed and super excited about the response for this and INCREDIBLY appreciative of all the support! So I just wanted to take a moment to thank everyone, literally! (Or atleast, as best as I can from the logfiles I have available – and if I missed anyone please accept my apologies and thanks!) So I’m proud to say, and I’m sure I speak for Nate here as well, THANK YOU everyone for voting and spreading the word! A very special EXTRA thanks to Monica Wright for encouraging me to submit a panel idea, Nate Bonilla-Warford for joining me to make this panel legit and to Jessica Barnett and Margot Bloomstein for all the guidance, support and ideas. The first round of selected panels will be formally announced September 20th, so we’ll keep you posted. But regardless of whether we’re selected let’s keep the Foursquare Day conversation going – and I hope to see YOU at SXSW! Thanks again!!! Now, as you know, Facebook launched Facebook Places last week, and during the launch event they shared the stage with foursquare (and other partners) to speak about possibly integrating with Facebook Places. Now comes the ensuing discussion about foursquare’s relevance now that Facebook will be deploying Location-Based Services to their 500,000,000 users. Given the panel topic and our thesis about Foursquare Day 2011 I feel that I need to weigh in on the subject: I don’t think that foursquare is going to go away anytime soon. I think that Facebook Places will either integrate smoothly with foursquare to their mutual benefit or foursquare will march on without them to continued success. On one side of the argument I think that the opportunity for foursquare here is tremendous. Facebook included foursquare at their Places launch event and appear to want them to integrate with their Places service in some meaningful way. They’ve also opened the door up for others to integrate as well (Gowalla, MyTown and Yelp so far). Effectively Facebook has handed the keys to their 500 million users to all these services. Given Facebook’s simplistic “check in and find out where your friends are checked in” service model I think there is a very strong possibility that Facebook intends to completely leave “value-added” experiences like badges, discounts and mayorships to 3rd parties to deliver. This might play out in the way Facebook applications have played out – 3rd parties would compete on the merit of their value-adding check in experiences through the marketplace of Facebook users choosing to integrate their service, or not. Given this opportunity the future is bright for foursquare: Facebook Places integration means that foursquare’s user base can grow as Facebook Places goes (which is already happening, by virtue of Facebook Places being a mainstream LBS educator). A win, win. To recap, the feeling is that Facebook Places is currently just barely viable, Mashable readers atleast still prefer foursquare, yet if only 1% of Facebook adopts Places it’ll be bigger than foursquare. One of foursquare’s opportunities here is to convert Facebook Places users (as I discussed above). But hope for Facebook Places integration should be tempered by the fact that Facebook and Twitter have not played nicely in the past. Of course, since only 1% adoption makes Facebook Places huge the business opportunity is also huge, but it if only businesses are excited about this (I too am guilty of this, thinking from a marketing perspective and being excited there more than anything) then that’s a bad sign. This led the group to think on motives behind why foursquare was created versus Facebook Places, which pointed out that the spirit behind each yields different community reactions (Facebook rebellion as a movement versus Foursquare Day as a movement). With either possibility, Facebook Places integrating smoothly with foursquare to their mutual benefit or foursquare marching on without them to continued success, it’s pretty clear that foursquare does not need to check out of the Location-Based Services game. Facebook Places may earn the “uber-mega-super-duper swarm” badge for having a larger user base, they won’t take over as mayor anytime soon. However by growing the LBS community, be it through Facebook or foursquare, we all stand to benefit- and that’s why I’ve proposed the SXSW panel. Please give it a vote, spread the word and let us know what you think! After re-confirming that I am, indeed, the mayor of all 3 MicorArts checkin locations (sans MicroArts SA of course), I started to explore this tool and realized I could use it to find out some awesome stuff that I can trot out to possibly get brands to pay more attention to foursquare and to start maximizing the value of the foursquare opportunity they’ve got in front of them (while helping to grow foursquare at the same time [which, in case you don’t know me, is something I’m passionate about]). Let’s start with Planet Fitness. Take a look at their foursquare analytics. Over 400 venus have been registered with more than a third of those venues having 50 or more checkins. That kind of active check in distribution is similar to Starbucks! Granted, there are over 16,000 starbucks venues registered and Starbucks is a foursquare sponsor, but still- there is a reason they are a sponsor- because people love checking in at Starbucks. And you know what, Planet Fitness? People love checking in their too- so why don’t you step up and recognize? I know you’re atleast aware of foursquare. But think of how great it could be to formally make foursquare part of the Planet Fitness experience! As the video in that link shows, being mayor of your Planet Fitness is awesome, and desirable. Us foursquare users who are also PF members know this. But Planet Fitness, you could harness this desire and bring it to the rest of the smartphone-toting Planet Fitness members (and potential members!) and create so much demand you’ll have to create new franchise rules to accomodate it! Ok, I can’t guarantee that kind of demand :P – but think of the possibilities! The other brand I wanted to highlight is, Cumberland Farms. Take a look at their foursquare analytics. The check in distribution is similar to McDonalds’ foursquare analytics – about a quarter of the 314 Cumberland Farms venus have had 11+ check ins. WIth only a slightly higher distribution of checkins in their favor, McDonalds embraced the Foursquare Day movement (and heck, they even became an early adopter of Facebook’s yet-to-be-launched location based service). But where is Cumberland Farms with their location based services…ahem…foursquare strategy? While I have to hand it to them for their pretty fun and effective Facebook page, I’ve got to say: Cumberland Farms, look at the numbers! You have a great Foursquare opportunity in front of you and you need to take advantage of it! Here’s an idea- how about free chill zone for the mayor? (disclaimer: I’m toooootally the mayor of my Cumberland Farms- but that’s only a small reason why I want Cumberland Farms to jump into foursquare :) ). Atleast experiment with it guys–at the very least, I’d like to see some participation in next year’s Foursquare Day. The opportunity is yours to make happen! So, what about you? 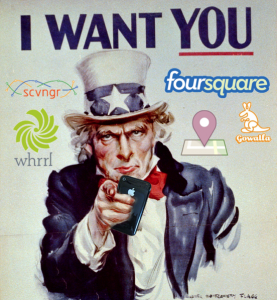 What brands would you like to see take advantage of the foursquare opportunity? Let’s talk about it and perhaps we can make a game plan for how we can get them involved!